Macros are software applications that run inside other applications, like Office packages. While some very sophisticated macros are real pieces of Software, demanding professional developers, ANYONE can create their own automation macros in any of the Microsoft® Office applications. Macros are software applications that run inside other applications, like Office packages. In fact, many commercial software's now include some form of end-user programming to allow for customization and automations of common tasks. Microsoft's VBA (Visual Basic for Applications) is the macro language bundled into Office and currently licensed to many other software makers. They are very useful to extend the usefulness and productivity of the Office applications. As an example, in this website you can find, among others, Macros that build calendar plans using Excel and no extra software. Macros exist for all current Office applications, but only the most recent versions of Outlook (from 2000) support them (previous version have a different programming model). This article will use EXCEL for illustrations purposes, but in general its concepts will apply to all Microsoft® Office Applications. Macros are potentially dangerous. Since they are software and run by the PC user, they can do almost anything on the computer they're running, including erasing the hard drive and other forms of damage. And since they are imbedded in office applications, they can be mailed as regular office files. In fact, one of the first virus to use email to spread was the Melissa Virus, a Word Macro! Of course, back in 1999, email virus were just starting and nobody expected them, so email was considered safe and no defenses were in place. Click here for a full article on Office macro security in this website. IMPORTANT NOTE: If you have trouble running macros when following this article, please refer to the article above and adjust your security settings before proceeding. Automation macros are macros that automate a set of manual operations – allowing users to avoid having to manually repeat an operation. These macros are usually not coded but recorded, using the Macro Recorder. Coded macros are macros that are written by software developers and that, in reality, are peaces of software that run (and require) a hosting application to run – Like Excel. For an example of a Coded macro, that is too complex to be generated by recording an example, click here to download the demo of our Calendar Plan Generator macro. This article is about generating Automation macros, the ones that ANY user can create, even if they don’t write a single line of software! You now have a macro that will apply the border to ANY cell selection. Run it from the Tools Menu: Select Macros, Macros again. PIC 6: Macro (VBA) Editor (Click to Enlarge). You may experiment with changing the code. To avoid destroying it, you may save the original macro, create a copy and edit the copy. If you end up with an unusable macro, you may just delete the copy and make a new one from the original macro. Macros are usually saved with the file where they were recorded. This mean they will also be available on that file, regardless of the computer used to open it. So, if you email the file to a friend, the macro will be there. To save the macro with the file, just save the file with the Save command. It will be saved with your data and all other file contents (Charts, formats, etc). This option may not be available for all Microsoft Office applications, but is available in Excel. 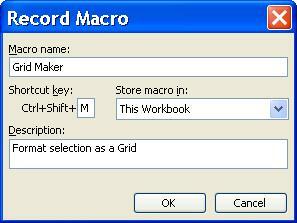 You may save your macro as a AddIn that its loaded with Excel every time it starts. This way, if the macro is generic and can be useful in many files, it will always be available regardless of the file currently being edited. The drawback is that in this format, the macro behaved as an Excel extension on that computer and, therefore, will not be available on other computers (unless specifically installed on them) and will not travel with the data files (if you email a file to a friend, the macro will not be there for him because it is installed on your PC, not the data file). From now on, your addin will load with Excel and the macro will be available every time you run Excel, but only on the PC where it has been saved. To install it on other computers, just mail them the original Excel macro file and repeat the steps above on each one. Check our FREE PC Tips. They will be regularly published. Better still, subscribe our Email Newsletter. You will be informed when contents updates are made and automatically granted participation on any future promotion.